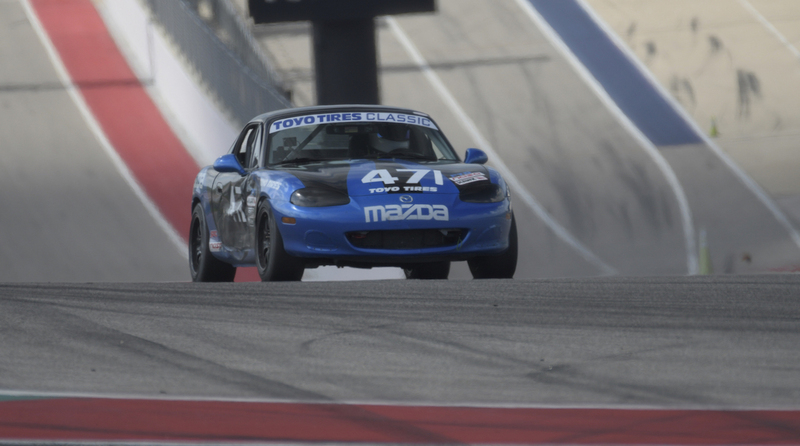 Brett Westcott was ready to race in the National Auto Sports Association Championships in Austin, Texas, but there was one problem: His car wouldn’t start. Luckily for the 34-year-old Westscott—who was competing in the Performance Touring D category—a friend who was racing in another category, Chris Kopitski (above right), had brought a second car to the competition and said he would loan it to Westcott (above left). Thanks to the loaner car, Westcott not only got to race, but he was the first to cross the finish line. “It was nice to finally get on the top step,” said Westcott, who had earned two second places and a third place in four previous trips to the national championships. Hoping to get an extra edge on the competition, Westcott had built a new engine for his Nissan NX-2000 before the race. He then brought his car from his hometown of Omaha, Nebraska, to Austin. The championships took place over four days in September and attracted 467 amateur and professional drivers in 31 categories. He was testing out his car on the track before the competition when the oil light came on and the engine broke down. Westcott, who works at an auto body shop, went to work to try to fix the car. But time was running out, and the car still wasn’t drivable. Kopitski, who is from Sioux Falls, South Dakota, loaned Westcott his second car, a Mazda Miata, and Westcott made the most of the race. Since his big win, Westcott has put the original engine back in his Nissan. He has won three races with the old engine in the car. “It’s working now,” he said with a laugh. Racing has always been a part of Westcott’s life. He grew up watching his dad, John, in stock car and drag races. John is also an auto mechanic, so Brett watched his dad build engines and fix the cars himself. Watching his dad scrape together the parts he needed to race inspired Westcott to work hard and not worry if he couldn’t afford the best car parts. “His passion for racing and his ability to figure things out when he didn’t have all the best stuff is what rubbed off,” Westcott said. It wasn’t until he was 24 that Westcott decided to try racing for himself. He said he wasn’t very good at first. But he didn’t give up and kept practicing on local racetracks in Nebraska and Iowa. He also uses a simulator on his computer at home to get a feel for what it’s like to race at different tracks. Last year he got into his first accident during a race in Topeka, Kansas. Westcott crashed his car, which was a Nissan Sentra, into a wall going about 100 mph. The accident occurred so fast that he didn’t know what happened until afterwards. “I was driving and then suddenly I wasn’t,” he said. “There wasn’t time to be scared.” His vehicle was in bad shape. But, thanks to safety gear, Westcott was unharmed. Until then, he will continue to race whenever he can. He hopes his story encourages kids to follow their dreams. The key to succeeding is to ask for help when you need it, Westcott said.